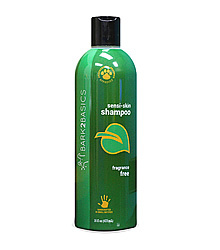 Ultra mild hypo-allergenic, tearless shampoo for especially sensitive skin pets and pet faces. Sensi-Skin Hypo-Allergenic Shampoo is specially formulated for professional groomers for pets with allergies and sensitive skin. Sensi-Skin Hypo-Allergenic Shampoo is tearless and can be safely used for frequent bathing without skin irritations. Sensi-Skin Hypoallergenic shampoo is safe for use on puppies and kittens. It contains no fragrances, colors, or harsh additives and ingredients that build up on the coat. Sensi-Skin Hypo-Allergenic Shampoo rinses easily and leaves coats luxurious, healthy, and shiny. pH balanced for pets skin. Natural, premium quality, professional grooming products. Bark-2-Basics products are made from only the finest natural ingredients. These products contain no fillers, thickeners, harsh additives, oils, lanolins or silicones. Bark-2-Basics products clean thoroughly, rinse easily and leave no residues to build-up and bind into coat. All of the Bark-2-Basics products are pH balanced for pets skin, are biodegradable, environmentally friendly and cruelty free and can be safely used on dogs, cats, puppies and kittens.